I am selling an MXR M88 Bass Octave pedal. It is in excellent condition and works perfectly. The pictures speak for themselves but if you have any questions feel free to ask and I'll try to help. destined to be a classic filter pedal.The back has some mess on it as you can see but its..the back. Front looks nice. Original box.Has separate footswitch to choose High/Low gain.Mix knob to blend dry and effect for clarity.Good for bass or guitar. Brand new and received last week. New pedal, hardly used at all. Perfect in every way. Even the power supply is still in the original wrapping. Great pedal, I just have too many of them! 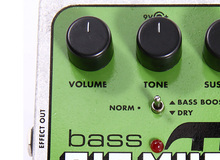 Boss CEB-3 Bass Chorus. Very good condition, only used on a few gigs. I don't have the original box or a power supply to include. Bass Chorus M 83 ..